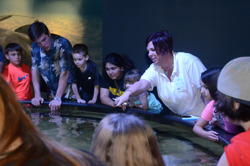 The Aquarium offers many opportunities for students and teachers. Plan an unforgettable fieldtrip, take your homeschool group on a scavenger hunt, or schedule an outreach event and let us bring the Aquarium to you. Dive into the world of wonder and water, with a wide array of educational exhibits and programs. The Aquarium is home to thousands of aquatic animals from across the state. In our galleries, explore a mountain waterfall and trout pool, a cypress swamp, river otters, jellyfish and our Living Shipwreck, holding more than 300,000 gallons of water, big sharks and an ocean of fishes. Enjoy two hands-on touch pools with your students. Our auditorium seats 150 for live animal presentations and other programs. As a teacher, you're always looking for new ways to inspire and engage curious minds. Allow us to serve as an educational resource for you and your students. We also offer professional development opportunities for teachers. 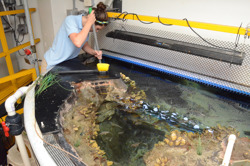 The Aquarium offers many different opportunities for students. Job shadowing, junior volunteer programs, internships, and teen ambassador program. Click the student button for more details and application guidelines. Prepare to get your feet wet! Let the Aquarium Come to you! 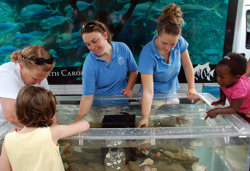 The North Carolina Aquarium at Pine Knoll Shores offers traveling programs designed to bring fun, hands-on, educational activities to your event or classroom. Click the outreach button for more information. Schedule a field trip to the Aquarium and let the fun and learning begin! 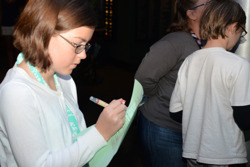 Students can interact with educators, explore North Carolina's aquatic animals, and experience hands-on learning through Aquarium-themed scavenger hunts. 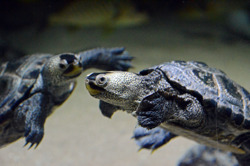 In addition to the one free visit, the Aquarium holds a special Homeschool Day event. During this event, all children in the immediate homeschool family are invited to attend. This includes children who are not school age, and two adults (additional adults will still have to pay general admission). Proof of homeschool status is also required during Homeschool Day.